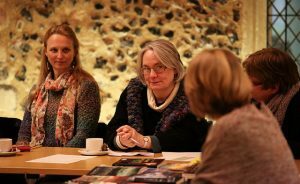 Sometimes the question arises in book groups: Should we keep our current numbers limited, or open up the group to new members? Some members want to introduce someone new, while others want to keep the core intact. It’s a tricky subject for book groups, and it all depends on your goals. Reading Group Choices offers these thoughts on when and how to decide if opening your group is the best next move. Sometimes groups meet in restaurants, coffee shops, small apartments, and other spaces that restrict the number of members. If your group is long established with friends or family, and if the discussions are enjoyable and provide a space for you to connect with the people you know best — then it’s natural to keep your current membership in place. Your group may be ready for fresh opinions and new reading tastes! Groups sometimes naturally drift apart as members become busy, and perhaps you find your core attendance becoming smaller and smaller. When opening a group, consider these questions: Why are you or other members resistant to adding new readers? Why do you think it might disrupt the dynamic? Is all disruption bad? There’s nothing wrong if your group shares the same opinion about your books, and has the same taste in genre. But it might be a welcome change to have someone at the table who doesn’t like a book, or who can offer a new genre to explore. Ask yourself if the change you resist is for personality reasons (perhaps this new person is known to be dominant or impolite), or because you want to stay comfortable. And even a more argumentative person may challenge others to think about and defend their opinions more carefully! Changing or adding members can be difficult. What’s most important is communication. If certain members want to bring in new readers but others do not, the group may end up splitting apart. When an original group doesn’t want to grow or merge, it’s common for some members to start or join a second club. It’s important to have a discussion about what’s best for the group. Consider meeting offsite for coffee, dinner, or a drink with the intention to discuss your group’s future. Picking a neutral location and a public atmosphere may allow people to share their feelings more openly. Start with a simple statement such as, “I would like to find a way to begin including new members.” Discuss the benefits and disadvantages of remaining closed or opening up. This type of conversation may need someone to lead it. If your group has a coordinator or leader, then that person can act as a mediator. If not, consider creating that role for one of your members, or better still, have the position rotate among members, changing every six months. Constructive discussions about your group may happen more easily when someone is in charge. Add some variety… without adding members! If your group isn’t able or ready to open to new members, some alternatives exist. Hold a special meeting twice a year where members can bring a friend. 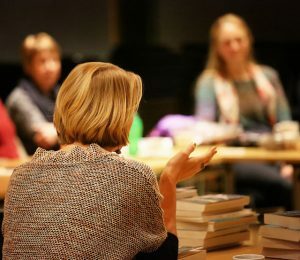 Call it a book club social: You can still hold a discussion, but perhaps relax the rules or choose a different location so that existing members can mingle with new faces. This will also allow potential members to meet each other, which may result in them forming a new group! Hold a book group exchange. If you’re in more than one group, or have friends in other groups, pick a month to “exchange” a couple of members. This will give everyone a window into how other clubs operate. You might come away with new ideas! If you have a large pool of members, with a rotating handful who come, consider adding a second, different meeting time and place each month. If you meet every third Thursday evening, add a Saturday morning session. Members will have a choice every month to fit their schedules, and the composition of the group will change without inflating your numbers. It can be frustrating to be new to a community and turned away from a book club because it has a member limit. Sometimes bookstores offer groups that become very popular, with a long wait list. Consider starting with another, newer group, even if the genre is different from what you usually read. Or consider forming your own! Talk to your local independent bookstore or library and let them know you’re interested. They may have heard the same from others, and can likely connect you to a new group. Take a look at our Book Group City Tours for places to get started with groups, and investigate your own city or town! In the end, what matters is a rewarding experience and hours of good reading and discussion. Happy reading! We want to hear from you! Email us or write to us on Facebook with how you’ve handled opening your group, and we’ll feature your responses in an updated post!